Will Ewing cut signature. Includes 8 X 10 photograph, name plate, matted and museum quality framing. Primarily a catcher, Ewing was versatile enough to play all nine positions, which he did, and fast enough to steal 354 bases. He hit .300 in ten different seasons. 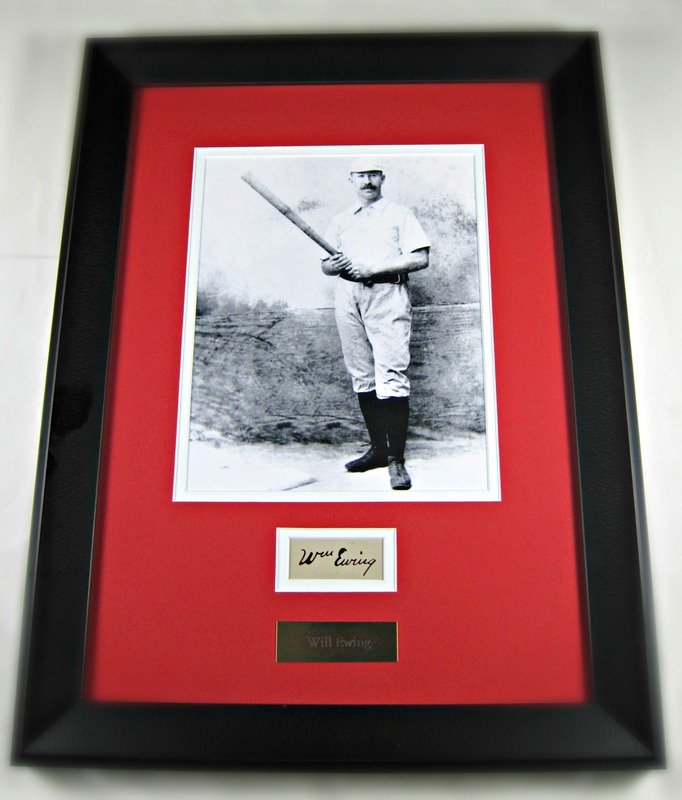 Playing until 1897 with the New York Giants, Cleveland Spiders and Cincinnati Reds, Ewing posted consistently superb offensive numbers. Arguably his best season was in 1893 with the Spiders when he batted .344 with 6 home runs, 122 RBI, 47 stolen bases and 117 runs. In the first elections to the Baseball Hall of Fame, he and Cap Anson led all 19th century players. Three years later, in 1939 they were among the first 19th century players elected and Ewing became the first member who was primarily a catcher.